Bruxism is the grinding of the teeth, which frequently occurs during sleep, but can also occur during daytime hours. A significant proportion of the population is believed to either clench or brux their teeth. Bruxism affects everything in and around the mouth, including the teeth and all of the muscles and bones surrounding it, as well as your head. In some people, headaches and sore jaws may develop if a bruxing habit is left untreated: in others, this destructive process can go on for years without a person being aware until they seek dental treatment. Tooth structure can be destroyed by these destructive habits. The forces generated during bruxing may be even more than those generated during chewing: these forces can cause teeth to become sensitive, wear down and/or break. Also, for people who brux their teeth and develop headaches and tired or sore muscles in and around the mouth, sleep quality can also be affected. Stress is considered to be a factor for the development of bruxism, although not all causes are known at this time. Another factor in the presence of bruxism may be misalignment of teeth, which can cause teeth to wear against each other prematurely or with greater severity, resulting in a loss of tooth structure. In cases where misalignment of teeth is an issue, orthodontic treatment, such as Invisalign, can be done in order to align and straighten the teeth once again. This may not solve the issue of bruxism on its own in some cases, but teeth that are in proper alignment are less likely to wear down prematurely. A common treatment to stop the damage caused by bruxism is to use a night guard which is a plastic device that fits over the bottom or top teeth which absorbs the forces caused by clenching and grinding. Night guards are the most common bruxism appliance available and they are designed to protect the teeth from abrasion and will gradually reduce the muscle strain by allowing the jaw to move freely. Custom night guard appliances are comfortable and they are worn while sleeping. They are capable of reducing the damage to your teeth from clenching or grinding during sleep. The night guard appliances are made with resilient acrylic, which is custom made for your own teeth: these night guards are comfortable to put on, and are very durable, meaning that they can withstand great amounts of chewing and grinding forces. After you start with your bruxism treatment, you can look forward to waking up pain-free and refreshed. Using tooth impressions, an acrylic mouth guard can be created to minimize the abrasive action of tooth surfaces during your normal sleep. 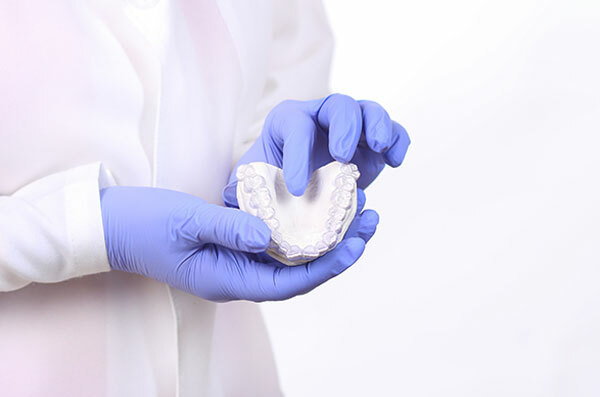 The mouth guards must be worn for a long time period in order to help prevent any kind of tooth damage, or damage to the temporomandibular joint and will stabilize the occlusion. If you feel that any of these signs are happening in your mouth, schedule a consultation at Albion Dental Office by calling (416) 749-9732, and Dr. Trotti will be happy to speak with you about any concerns you may have.